Flamingo Land Resort is delighted to announce the birth of a Rothschild Giraffe calf to parents George (8 years old) and Lizzy (5 years old) at 3am on Sunday 22nd March 2015. After a vet visit, it has been confirmed that this is a female. She was given access to the giraffe outside enclosure on 2nd April, and can now be seen by the public. The Rothschild giraffe herd at Flamingo Land, which is now 7 strong, was formed 6 years ago with the arrival of George and 2 females, and to date we have had 4 calves. This calf has one ‘full sibling’, a female called Pixie that was born on 12th March 2013, (almost exactly 2 years ago). The calf also has 2 half brothers, born to the same father – Rufus who was born in 2011 and Brad who was born in January 2013. 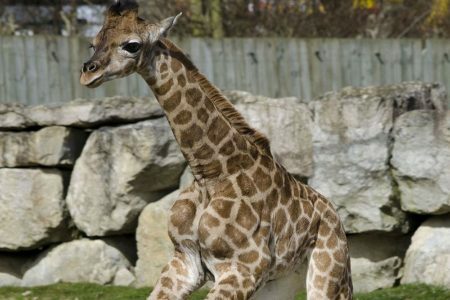 Rothschild giraffes are listed as Endangered by the IUCN and their population is still decreasing. Our giraffes are part of the European Endangered Species Programme (EEP). George was born at Woburn Safari Park in Bedfordshire and Lizzy was born in Opel Zoo in Germany. Get 3 for the price of 2 when you visit Flamingo Land. Click here to download the voucher.